Hillsboro’s Luke Middleton runs with a key fourth down reception that netted 35 yards Friday night at Goshen High School late in the second quarter. Deon Burns scored all three touchdowns plus the lone successful two-point conversion for Hillsboro in the first half friday night at Goshen High School. 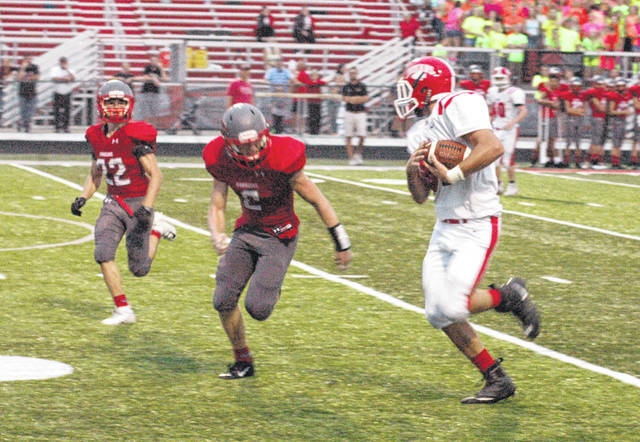 Goshen took the opening kickoff, but three plays later the Indians caught Goshen quarterback Conner Holmes behind the line of scrimmage, he fumbled, and Hillsboro recovered at the Goshen 12-yard line. Three plays leader powerful Hillsboro senior runningback Deon Burns plowed up the middle to paydirt. The try for two was no good and with 9:05 left in the first quarter, Hillsboro had a 6-0 lead. A couple fumbles haunted the Warriors again on their next possession. In eight plays, the Warriors drove all the way to the Hillsboro 34-yard line. But on the ninth play, they lost four yards on a fumble, and on the next play they fumbled again and Hillsboro recovered. Without throwing a single pass, the Indians drove 55 yards with Burns capping the 11-play drive with another 4-yard TD plunge. Burns plowed in for the two-point conversion, and with 42 seconds left in the first half, Hillsboro had a 14-0 lead. After the two teams traded possessions, Goshen struck fast. On the fourth play of the drive, and facing a third-and-12-yards-to-go situation, Holmes threw a short pass, and the receiver gathered it in and raced 68 yards for a TD. The kick was good, making it 14-7. The Indians took advantage of a short field two possessions later. A short punt gave Hillsboro good field position, but it looked like it might be wasted when the Indians were facing fourth down and long. But quarterback Mason Swayne hooked up with Luke Middleton for a 35-yard pass completion to the Warriors 8-yard line. Two plays later, Burns scored from three yards out. The two-point try failed, but with 22 seconds left in the half, the Indians had a 20-7 lead. The game was postponed due to lightening in the area following halftime on Friday night and the Indians returned to Jim Brown Stadium at 2 p.m. on Saturday to play the second half of the game. Hillsboro added a touchdown with 8:35 to play in the third quarter on Saturday as Josh Keets scored on a 15 yard scamper to extend the Indians’ lead to 26-7 after a failed two-point try. The Indian defense stepped up on the ensuing Goshen possession as Hillsboro’s Max Conover sacked senior Warrior quarterback Trey Armacost for a 14 yard loss on the second play of the drive. Mark Gallimore ended the Warrior’s drive a short time later as he stepped in front on an Armacost pass for the interception. From that point on it was all Hillsboro as they held the Warriors scoreless in the second half. The Indians put a stamp on the end of the game as Swayne intercepted the Warrior’s final pass of the game with time expiring. Hillsboro also ran a nifty fake punt play with just under five minutes to go in the game. The Indians lined up as if they would punt the ball , however the snap went directly to Reece Bloomfield who completed a pass to Logan Hester to convert the fourth and 11 play. Both Hillsboro and Goshen entered the contest 1-0. Hillsboro opened the season with a 30-28 victory over Western Brown, and Goshen beat Cincinnati McNicholas 21-7 last week. Hillsboro is at Richards Memorial Field next week for its first home game of the season against East Clinton. Kick off is at 7 p.m.